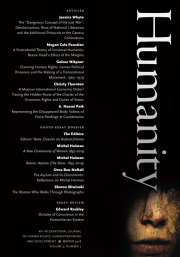 This is a pre-publication version of Patrick Weil’s essay, due to appear in Humanity this year. We post this version in light of pressing political developments in France that revolve around questions of citizenship, immigration, and sovereignty, precisely the themes explored here. Photo courtesy: Philippe Wojazer/pool via AP. Since the Rights of Man were proclaimed to be ‘inalienable’ irreducible to and undeducible from other right or laws, … man appeared as the only sovereign in matters of law as the people was proclaimed the only sovereign in matters of government. Targeted killings by drone strikes ordered by the Obama administration have provoked vigorous debate in the United States about the power the executive holds to order the killing of enemy combatants without due process. However, questions regarding the U.S. administration’s use of drones draw much of their potency from the fact that a number of these targeted persons are, irrevocably, American citizens. If the president could have stripped an American of his citizenship and then authorized his death as a foreign combatant, such an act might have eluded public debate. The U.K. Home Secretary has, since 2006, revoked the nationality of at least 53 Britons as part of program targeting U.K. citizens allegedly linked to militant or terrorist groups. Some of these individuals have subsequently been killed by drone attacks, all without provoking any public reaction in the U.K. What is legally possible today in the U.K.—to denationalize a citizen if he has done anything “seriously prejudicial to the vital interests” of the state—was a longstanding government right in the United States. This authority was lost in 1967 when the Supreme Court handed down its decision in Afroyim v. Rusk, which ensured that an absolute protection existed for American citizens against forced expatriation. Both before and during the Second World War, the Soviet Union and Nazi Germany had rendered hundreds of thousands of their citizens stateless. Since the beginning of the 20th century, the victorious democracies had also denaturalized some of their own citizens. However, these two categories of denaturalization and of denationalization can be distinguished by their nature. The scope of the democratic varieties is strictly limited by law to certain specific situations or crimes, whereas there is no limitation to authoritarian denaturalization, based on a totally discretionary power. In the case of democratic denaturalization, an external control to governmental action, located in the hands of a judiciary power limits its scope and impact. Regarding democratic denaturalization, there is often a self-restriction of action by the executive: despite the fact that many naturalizations could fall within the limited scope of the denaturalization law and jurisprudence, the executive power tended (in the US from 1909 until 1942 and in France since 1927) to self-limit its actions. On the contrary, under authoritarian rule, denaturalization action by the executive tends to go to the limit of the “laws.” Yet, democratic denationalization categories lead to the same consequence for the subject individual (that is to say, the deprivation of citizenship) and did so during the years which followed the end of the Second World War. However, citizenship in the postwar era has become one of the most respected and protected of all human rights. The protection of citizenship is among the landmark achievements of the second half of the twentieth century. It is also one of the most overlooked. Among the numerous rights proclaimed by the non-binding Universal Declaration of Human Rights adopted by the UN General Assembly on December 10, 1948, the “right to a nationality” has become a near absolute right: when a person lacks a citizenship or the functions it plays in linking an individual with a nation state, the international community provides a proxy through the 1954 Conventions on the Status of Stateless Persons and Refugees and the United Nations High Commissioner for Refugees (UNHCR).This right, while not part of the binding International Covenant on Civil and Political Rights( ICCPR), was increasingly guaranteed through different legal means and instruments—a patchwork of overlapping mechanisms operating at the international and national levels. The 1961 Convention on the Reduction of Statelessness ensures that children are provided with a nationality at birth and prevents the deprivation of citizenship to the extent that an individual cannot be rendered stateless. Signed by a majority of European states, it has limited the possibility of denaturalization—a prospect revived in Europe following September 11th but meant to ‘only’ apply, even in the United Kingdom, to bi- or multi-nationals. The United States has taken a different path. The Supreme Court, followed by Congress, proclaimed that American citizenship is guaranteed an absolute protection against forced denationalization in accordance with the Fourteenth Amendment, even if American citizens possess another nationality. But the significance of the Court’s position extends beyond this protection: in articulating it, the Court also proclaimed the sovereignty of the American citizen. What did the Court mean by this statement? When, in 1958, Chief Justice Earl Warren stated that the American citizen was sovereign and when, in 1967, Justice Hugo Black made this principle the opinion of the Court, scholars received the concept negatively or paid it no notice. Yet it is on the basis of this concept that the absolute protection of American citizenship against forced expatriation is guaranteed today. And the significance of this position extends even further. The concept of the sovereignty of the individual citizen reconnects with the largely forgotten origins of a revolutionary tradition exemplified in the thoughts and opinions of James Wilson and recognized by Hannah Arendt. In two important decisions—Chisholm (1793) and Dred Scott (1857)—the Supreme Court affirmed the sovereignty of the citizen. But both were reversed by two constitutional amendments—the 11th and the 14th. However, following Afroyim, the ‘sovereign citizen’ became the law of the land. This article is first concerned with understanding how this came to be. To do so, it tells the story of how some Supreme Court justices—originally in the minority on the Court—found a way to secure Americans their citizenship rights. Then it discusses how the definition of the citizen as sovereign challenges both the classical definitions of citizenship and of sovereignty, thereby allowing for a renewal in the standing of democratic institutions and democratic thought itself. In the middle of February 1958, Earl Warren—the Chief Justice of the United States Supreme Court—was battling to find both a majority and a justification for what had been his conviction since 1955: denationalizing an American-born citizen was unconstitutional. This situation was strange and unexpected. Totalitarian regimes had denationalized and denaturalized extensively in the interwar period and during World War II. The Soviet Union revoked the citizenship of 1,500,000 of its citizens. The Nazi regime denaturalized 40,000 people and revoked the citizenship of 40,000 native-born citizens. In France, between 1940 and 1944, the Vichy regime denaturalized 15,000 people, mainly Jews, and revoked the citizenship of 500 native-born citizens. But denaturalization procedures and policies were far from uncommon in democratic countries. The citizenship of 1,200 naturalized French citizens was revoked from 1915 onward. Similar policies adopted in the United Kingdom in 1918 led to 300 individuals losing their citizenship during the twentieth century. In the United States, denaturalization was statutory beginning in 1906. Between 1906 and 1944, 22,000 naturalized Americans had been deprived of their citizenship. In addition, the US government began to implement a section of the 1940 Nationality Act which stated that an American would lose his or her citizenship if he or she voted in foreign elections, escaped the draft, or lived in a foreign country—adding to a list which already included denationalization for Americans who became citizens of a foreign state. After 1945, an average of 5,000 Americans were denationalized annually for several years. Even with the rate slowing in the mid-1960s, the total number of denationalized Americans, mostly native-born, reached 124,500 between the years 1945 and 1977. Denaturalization was originally meant to empower the federal government to deter and eliminate fraud and illegality in the naturalization process, which was largely decided by state courts at the time. Very soon, however, it became a means by which to get rid of radicals. In 1909, Emma Goldman became the first American subject to political denaturalization. Starting in 1917—when courts began holding that naturalized citizens swore their oath of allegiance to the United States with a “mental reservation” if they acted against their adopted home after becoming American—anarchists, socialists, and opponents of the First World War began losing their citizenship by the dozens, later joined by communists and Nazis. In 1942, a program was initiated by the Justice Department for denaturalizing thousands of German-Americans linked to Nazi organizations. Yet the scope of denaturalization was significantly restricted by the Supreme Court with two decisions: Schneiderman, reached in 1943, and Baumgartner in 1944. This did not stop the U.S. government from applying denationalization policies to native-born Americans. The first case of a denationalized native-born American—Gonzales v. Landon—reached the Supreme Court in 1955. In a unanimous per curiam decision, the Court applied the heightened standard of “clear, unequivocal, and convincing” evidence, which had been required in the denaturalization case of Schneiderman. A few months later, the Supreme Court agreed to hear three more cases—Nishikawa, Perez, and Trop—which all involved denationalizations of Americans, each around a different provision of the 1940 Nationality Act. Mitsugi Nishikawa, born in 1916 to Japanese parents in California, went to study in Japan in August 1939. In March 1941, he was drafted into the Japanese Army. When Nishikawa applied for a U.S. passport after the war, his application was denied on the grounds that he voluntarily renounced his American citizenship by “entering, or serving in, the armed forces of a foreign state.” Clemente Martinez Perez, born in Texas in 1909, followed his parents to Mexico at the age of ten. In 1947, however, Perez applied in El Paso for admission to the United States as an American citizen. At a hearing before a board of special inquiry, Perez admitted to remaining outside of the United States to avoid military service and to voting in political elections in Mexico. He was ordered excluded on the grounds that he had expatriated himself. Private Albert L. Trop, born in Ohio, was serving at Casablanca in French Morocco in 1944. On May 22, he escaped from a U.S. Army stockade. He was gone less than a day and willingly surrendered to an Army officer while he was walking back toward his base. Yet a court martial convicted him of desertion and sentenced him to three years of hard labor, forfeiture of all pay and allowances, and a dishonorable discharge. In 1952, when Trop applied for a passport, the State Department informed him that he had lost his nationality on the grounds that he deserted the military during wartime. In the first justices’ conference meeting about these cases, on May 4th, 1957, Warren cobbled together a bare majority for reversing the decisions of the lower courts in all three cases and reestablishing the citizenship of Nishikawa, Perez, and Trop. Warren assigned himself the opinions and circulated drafts on June 5th. Upon receiving Warren’s drafts, Justice Felix Frankfurter announced his decision to write his own opinion but requested time for it. The three cases were reargued at the beginning of the 1957 Term, on October 28th. When the justices met in conference one day later, Warren had lost his majority. Frankfurter had convinced a majority of his colleagues that the sovereignty of the state with respect to its citizens, along with Congressional powers to declare war and regulate foreign affairs, justified the power to denationalize. The whole concept of our government is opposed to regulation of citizenship. Whether the concept was of compact, federalism, sovereignty of the individual or some other, citizenship is the basic and inalienable right of the individual. In the constitutional debates, in the Federalist or any other contemporary literature[,] there is no suggestion that Congress be given the right to denaturalize citizens. I am convinced that such a suggestion would have been shocking to the Founding Fathers and the American people. What is this Government, whose power is here being asserted? And what is the source of that power? The answers are the foundation of our Republic. To secure the inalienable rights of the individual, “Governments are instituted among Men, deriving their just powers from the consent of the governed.” I do not believe the passage of time has lessened the truth of this proposition. It is basic to our form of government. This Government was born of its citizens, it maintains itself in a continuing relationship with them and, in my judgment, it is without power to sever the relationship that gives rise to its existence. I cannot believe that a government conceived in the spirit of ours was established with power to take from the people their most basic right . . . with power to decree this fate. The people who created this government endowed it with broad powers. They created a sovereign state with power to function as a sovereignty. But the citizens themselves are sovereign, and their citizenship is not subject to the general powers of their government. The basic constitutional provision crystallizing the right of citizenship is the first sentence of section one of the Fourteenth Amendment. It is there provided that ‘All persons born or naturalized in the United States and subject to the jurisdiction thereof, are citizens of the United States and of the State wherein they reside.’ United States citizenship is thus the constitutional birthright of every person born in this country. When writing this dissent, by which point he was declaring citizenship an absolute right following a literal interpretation of the Fourteenth Amendment, Warren was in the minority on the court. He had managed to recover a majority in Trop—where the transformation of an American citizen into a stateless individual was found to be contrary to the Eighth Amendment, which prohibits the federal government from imposing cruel and unusual punishment. But the Eighth Amendment stopped short of protecting all native-born American citizens from a forced deprivation of their citizenship, which was what Warren and Black were looking for. By this stage, too many contradictions obscured the reasoning behind the Court’s successive decisions. Perez was deprived of his citizenship in 1958 for voting in foreign elections on the grounds that Congress exercised power over foreign affairs. But with Schneider v. Rusk this power was suddenly limited. And on the same day that the Schneider decision was handed down, an equally split Supreme Court confirmed the denationalization of Herman Marks, a native-born American, despite its consequence—statelessness, which six years earlier in Trop was held to be contrary to the Eighth Amendment. Marks had joined the forces of Fidel Castro in Cuba, which in the opinion of the court made his case different from that of Trop, who deserted the American army (for 24 hours) without joining a foreign army. “I[t] would be interesting to know what the ‘law of the land’ is on the subject of expatriation” wrote Philip Kurland in his review of the Supreme Court’s 1963 term, emphasizing “the lack of continuity in the Court’s opinion” in denationalization cases. As Black would write soon thereafter in a majority opinion, “Since Perez, this Court has consistently invalidated on a case-by-case basis various other statutory sections providing for involuntary expatriation.” But it did it without “finding it necessary to confront the fundamental issue of whether Congress can constitutionally deprive a person of his citizenship against his will.” The Fourteenth Amendment was becoming increasingly relevant. Other nations are governed by their own constitutions, if any, and we can draw no support from theirs. In our country the people are sovereign and the Government cannot sever its relationship to the people by taking away their citizenship. Our Constitution governs us and we must never forget that our Constitution limits the Government to those powers specifically granted or those that are necessary and proper to carry out the specifically granted ones. …. Citizenship in this nation is a part of a cooperative affair. Its citizenry is the country, and the country is its citizenry. Four years later, in Rogers v. Bellei—a case regarding the status of an American citizen born in a foreign country—the Court reaffirmed the role of the Fourteenth Amendment in protecting American citizenship while excluding Bellei from the amendment’s benefits and protection. By becoming the law of the land, Afroyim had put an end to forced denationalization. Yet if the absolute protection afforded by the Fourteenth Amendment was affirmed, the reasoning applied by Black and Warren to reach their conclusions did not convince all. Bickel was uncomfortable with the distinction made between persons and citizens while remaining comfortable with a jurisprudence which had permitted the U.S. government to denationalize native-born Americans, at times rendering them stateless. The new “sovereign” protection attributed to the individual American citizen was not diminishing—or being made at the expense of—the rights guaranteed to all persons by, for example, the Fourteenth Amendment. At least Bickel had noticed the concept of sovereignty and its importance in the Warren dissent in Perez and in the Afroyim majority opinion, even if only to oppose it. Alex Aleinikoff perceptively noted that, in the language of Justices Black and Warren, different approaches and varying definitions of citizenship mixed up in such a way as to justify the absolute protection of it. To rights-based, contractual, and communitarian claims Aleinikoff adds the consent perspective in the interest of looking for anyone who could convincingly justify the ban on denationalization. But Aleinikoff did not mention the concept of sovereignty of the citizen as a possible justification for the court’s absolutism. From all sides of the academic spectrum, the concept of “sovereign citizen” received either negative attention or no attention at all. Its presence emerged in the middle of other theories of citizenship. These reflected, in turn, a search by some of the justices for grounds on which to defend all American citizens against forced expatriation. The conceptual path finally chosen by the American Supreme Court not only ensured such an absolute protection but, through the reinvention of a democratic revolutionary tradition, it reframed the concept of sovereignty and created a new hierarchy between American citizens and their government whereby citizenship is greater in value. To gain a better understanding of how significant this is we must first turn to a discussion of how it came to be. 2. What Is a Citizen? When Nishikawa, Perez, and Trop arrived before the court, Warren used the classical definition of citizenship included in, for example, the landmark decision of the International Court of Justice, Nottebohm: citizenship entailed both rights and obligations domestically and protection internationally, outside of a citizen’s country. This was a significant definition which offered an answer to the question: once such a link exists, what are its consequences? Warren started by borrowing from Hannah Arendt the concept of citizenship as the right to have rights, which she uses in The Origins of Totalitarianism. Her terminology made its way to the Supreme Court—in the Perez dissent and Trop decision—along an interesting path. Jon Newman, Warren’s senior clerk who worked on the Chief Justice’s opinion, borrowed the words “right to have rights” from Chief Judge Charles E. Clark’s dissent from the Second Circuit’s decision in Trop. In that decision, Clark quoted from, and highly praised, a brief article on “The Expatriation Act of 1954,” published by the Yale Law Journal in 1955, which argued that no description of expatriation as a loss of particular rights is adequate. Expatriation represents a loss of the right to have rights—a loss of membership in an organized community capable of guaranteeing any right at all; in advancing this claim, Arendt is cited as its source. Warren states in Trop that the stateless “has lost the right to have rights.” In Perez he adds that “Citizenship is man’s basic right, for it is nothing less than the right to have rights. Remove this priceless possession and there remains a stateless person, disgraced and degraded in the eyes of his countrymen. He has no lawful claim to protection from any nation, and no nation may assert rights on his behalf.” But while defining citizenship as the basis for rights and the protection necessary for the legal status of any human being—the court was able to forbid the creation of a stateless person and would finally protect Trop—it could not prevent the expatriation of Perez. Unlike Trop, Perez possessed another nationality: he was also Mexican. Even if he were expatriated, as a Mexican he could continue to enjoy “the right to have rights.” Therefore this conception of citizenship could not be the basis for the complete security of American citizenship which some justices were seeking. This speaks to something different from rights. There is no better situation by which to understand the difference in defining citizenship by rights or by one’s home and the protection it affords than the situation of colonial subjects of the old French or British Empires. A colonized Algerian, having lost his documents while traveling outside of the borders of the French Empire, would be able to get the protection of a French consulate and to receive a laissez-passer that would allow for his return to Algeria. Back then, such a person would find himself—if Muslim—in a situation of subjecthood with a low level of diminished rights. Nationality of the empire was often attributed to such persons, and while this underscored the sovereign power of a state over its subjects in the eyes of other powers, it did not serve as a basis for supplementary rights. Once again, however, the Court would not have protected Perez if it sought to identify his home given that he had lived in Mexico. It is in this context that the concept of the sovereignty of the individual citizen emerged. It is more likely that Justice Black had influenced the chief justice. Warren had a habit of entering Black’s chambers, where they would discuss cases and share ideas. The historical record shows that Black discussed the expatriation opinions with Warren at a later stage of the drafting process, while other evidence suggests that the two justices may have exchanged thoughts from the beginning. Taken together, Warren’s handwritten notes clearly reflect two stages of intellectual production. First, while preparing his opinion on Nishikawa a few weeks before this conversation with Warren, Black had the opportunity to develop his interpretation of the application of the Fourteenth Amendment to the practice of expatriation in light of the nation’s founding. In Nishikawa, Black joined by William Douglas was alone among the justices to base his opinion on the unconstitutionality of all of the denationalization provisions included in the Nationality Act and not, as the majority of the Court would end up doing, simply on the involuntariness of Nishikawa’s membership in the Japanese Army. Although it has received little attention in recent years, Black’s concurrence in Nishikawa is significant. In writing his opinion, Black lays out for the first time reasoning that would form the foundation for the U.S. Supreme Court’s approach to denationalization for years to come. Section 1 of the Fourteenth Amendment that confers citizenships and narrows a person born here with citizenship also provides that no state shall make or enforce any law which shall abridge the privileges or immunities of citizens of the United States; nor shall any state deprive any person of life, liberty or property without due process of law. The first of these two clauses plainly makes privileges and immunities of United States citizenship free from abridgment by a state. The Amendment then goes on to recognize a power in states to deprive all persons including citizens of ‘life, liberty or property’ if they are afforded ‘due process of law’. But even if afforded due process of law the state is granted no power under the fourteenth amendment to ‘deprive any person’ of the citizenship granted by the fourteenth amendment. In Black’s view, the wording of the first sentence of the Fourteenth Amendment: “[a]ll persons born or naturalized in the United States . . . are citizens of the United States,” was a proclamation of a right without any constitutional possibility of being reduced or forfeited. Unlike the subsequent sentence of the Fourteen Amendment, which permits for the life, liberty, or property of a person to be deprived with “due process of law,” no such diminution or limitation exists for citizenship. However, there was no mention of the concept of sovereignty in Black’s drafts in Nishikawa. The terms “sovereign” and “sovereignty” appeared in a second stage —they were used thirteen times in the ten pages of a new draft opinion written by one of Warren’s clerks for Perez, where they were intended to underscore the idea that citizens submit to the sovereignty of the state. Black and Warren were, perhaps, reacting to this new draft opinion—which they found to be overly “philosophical”—and, in the process, developing fresh ideas. This may have pushed them, after reading the draft opinion, to reply by turning the relationship between citizens and the state on its head: citizens are themselves sovereign and no organ of the government can strip an American of her citizenship. Black “discovered”—or rediscovered—a concept of the sovereignty of the citizen which was percolating within the theory of the American Republic since its foundation. He anchored it within jurisprudence by connecting it to the Citizenship Clause of the Fourteenth Amendment. This was more than just a way to guarantee protection over American citizenship for its bearers. Employing the concept of the sovereign citizen also served as a reminder that individual sovereign citizens stood at the origins of the American republic: while delegating many powers, they retained some basic rights along with a way to reorganize the classic hierarchical relationship between the state and its citizens. 3. How can a Citizen be Sovereign? In the understanding of Justices Black and Warren, the sovereignty of the citizen meant first that she had an absolute right to keep her citizenship free of any infringement made by a public power. This right, in turn, received absolute protection. Michael Walzer has applied to “rights” the distinction between “positive” and “negative” employed by Isaiah Berlin in his treatment of the concept of “liberty.” For Berlin, positive liberty is involved in the question: “What or who is the source of control or interference, that can determine someone to do or be, one thing rather than another” as opposed to negative liberty which “is involved in the answer to the question ‘What is the area within which the subject—a person or a group of persons—is or should be left to do or be, without interference by other persons.” Negative rights stand against certain sorts of aggressive and invasive acts. These were the kinds of rights that the justices wanted to guarantee by declaring the citizen sovereign. Such a position rendered the citizen a bearer of an absolute negative right. Regarding the question of status, the citizen had “the quality of a power that has no superior,” which was one of the definitions of sovereignty. Today, sovereignty is no longer tied to gods or their representatives (i.e., kings or emperors). Both senses of sovereignty hinge on citizens understood collectively as a body—they can be the source of law (and, for Kelsen, its object) while possessing the ability to suspend it (for Schmitt). It is the sovereign, following Schmitt’s analysis, who can determine that an exception exists and—during exceptional times—can then suspend the constitution with the aim of preserving it. Such action would now be taken in the name of the people, drawing on the citizenry for legitimacy. For such a sovereignty to function there must exist a condition of possibility: a social link which legitimizes obedience and which makes it possible that in some circumstances power, whether tied to one person or a group, can suspend the constitution and be obeyed by the state apparatus and its citizens. For Schmitt, the link which permitted this was nationality, understood as a cultural factor of unity and legitimacy. This allows recognition and identification between citizens and the sovereign to occur, even at the cost of denationalization. These two opposed approaches to sovereignty, one decisionist and one positivist, are both faithful to and dependent on a state approach to sovereignty. While possibly relying on citizens understood as a collective body, they never envisioned the possibility of the individual citizen as being sovereign. So was it a pure fantasy on the part of Justice Black and the US Supreme Court to proclaim the sovereignty of the individual citizen? Or was it just a metaphor which could not survive the real test of sovereign power? Their position was, at the least, not a complete conceptual invention: it had been already envisioned by political theorists, and by the Supreme Court itself in previous important decisions. First, Rousseau invokes a kind of “sovereignty” which the individual citizen possesses during “the moment the people are legitimately assembled as a sovereign body, [when] the jurisdiction of the government wholly lapses, the executive power is suspended, and the person of the meanest citizen is as sacred and inviolable as that of the first magistrate; for in the presence of the person represented, representatives no longer exist.” Sacred and inviolable are attributes and consequences of the sovereignty of the citizen. These are clearly affirmed when the citizen chooses his or her representatives for deliberating on the city’s affairs. However, between these rare moments of necessity or choice during which an individual—alone or with other citizens—exercised a sovereign power to activate other powers or institutions, the individual citizen was subject to the power of a collective body. The way Arendt uses the term sovereign and applies it to the individual is significant, even if it has never been mentioned in the numerous commentaries that address these famous pages. In her view, the sovereignty of Man—proclaimed by the French National Assembly in the 1789 Declaration of the Rights of Man and of the Citizen—pre-existed the adoption of constitutional rules for governing; it constituted negative liberties. Yet she describes how, in the century and a half that followed, the sovereignty of man was swallowed by the sovereignty of the people and with them—in two stages—the rights of men. Man was no longer sovereign in law because human rights were first made dependent on national citizenships and then, a little more than one century after the French revolution, the rulers of nation states established the power to deprive citizens of their citizenship. It is noticeable that there was the same movement in the United States toward affirming the sovereignty of the individual—of the individual citizen in the US case—and then retreating from it. In the first important constitutional case decided by the United States Supreme Court in 1793—Chisholm v. Georgia—the court rejected, by a vote of four against one, the state of Georgia’s invocation of its sovereignty as a justification for avoiding the possibly of being sued in court by a citizen of another state. Chief Justice Jay delivered one of the most clear, profound and elegant arguments perhaps ever given in a court of judicature, he took a view of the United States previous to the late revolution, when we were subjects of a sovereign[;] after our independence he considered the people as becoming individually sovereign. In this capacity they formed the present government. To the Constitution of the United States, the term SOVEREIGN, is totally unknown. There is but one place where it could have been used with propriety. But even in that place, it would not, perhaps, have comported with the delicacy of those who ordained and established that Constitution. They might have announced themselves “SOVEREIGN” people of the United States. But serenely conscious of the fact, they avoided the ostentatious declaration. Having thus avowed my disapprobation of the purposes for which the terms, state and sovereign are frequently used, and of the object to which the application of the last of them is almost universally made, it is now proper that I should disclose the meaning which I assign to both, and the application, which I make of the latter. By a State I mean, a complete body of free persons united together for their common benefit, to enjoy peaceably what is their own, and to do justice to others. It is an artificial person. It has its affairs and its interests; it has its rules; it has its rights; and it has its obligations. …The only reason, I believe, why a free man is bound by human laws, is, that he binds himself. Upon the same principles, upon which he becomes bound by the laws, he becomes amenable to the Courts of Justice, which are formed and authorised by those laws. If one free man, an original sovereign, may do all this; why may not an aggregate of free men, a collection of original sovereigns, do this likewise? If the dignity of each singly is undiminished; the dignity of all jointly must be unimpaired. It is inherent in the nature of sovereignty not to be amenable to the suit of an individual without his or her consent. This is the general sense and the general practice of mankind; and the exemption, as one of the attributes of sovereignty, is now enjoyed by the government of every state in the Union. However, the sovereign character of the states affirmed by the Supreme Court provoked important dissents in the Court and remained contested. In Hans, for example, Justice Harlan expressed his strong disagreement over the comments contained in the majority opinion in Chisholm v. Georgia. In Seminole, Justice John Paul Stevens noted that the “fundamental error that continues to lead the Court astray is its failure to acknowledge that its modern embodiment of the ancient doctrine of sovereign immunity ‘has absolutely nothing to do with the limit on judicial power contained in the Eleventh Amendment.’” And in Alden v. Maine, Justice Souter—followed by three other Justices—reiterated the opposition of a strong minority of the Supreme Court to “a ‘background principle’ of state sovereignty immunity…that operates beyond its limited codification in the [Eleventh] Amendment.” As Randy Barnett argues, this position was not based on the literal text of the Eleventh Amendment but rested instead on an underlying principle which could easily be abandoned in future court decisions. At least one can no longer state, as Alexander Bickel did, that Black and Warren’s affirmation of the citizen being sovereign could only be related to Dred Scott and Justice Taney’s majority opinion in that case. That said, what is common in both Chisholm and Dred Scott is that the Supreme Court affirmed the sovereignty of the citizen, though in each case—as Bruce Ackerman remarks—it was reversed by a constitutional amendment. However, when the concept of the “sovereign citizen” suddenly reemerged in Warren’s mid-1950s Perez dissent and then became key to the Court’s decision ten years later in Afroyim, it was not reversed; to the contrary, it was and continues to be reaffirmed. How and why is this the case? The answer can first be traced to the scope of sovereignty as it was affirmed. In Afroyim, the sovereignty of the citizen does not mean the possibility of blocking the entrance of new members into the citizenry, like in Dred Scott; of refusing protection given to public institutions, like in Chisholm; or of resisting majoritarian public policies as it is sometimes claimed today in the name of the “sovereign citizen.” It was firstly limited to the citizen’s right to maintain membership in the citizenry. This American move coincided with a choice by the international community, after the Second World War, to reduce the instances of statelessness through the different means we have described in the introduction. This was done, first, by making citizenship more secure and, second, by providing the attribution of citizenship to those at risk of falling into loopholes within divergent national citizenship laws. And for those who remained unaccounted for, the UNHCR would become the state for the stateless, taking on the consular function and ensuring that in their state of residence these individuals would receive the treatment guaranteed to the most privileged foreign resident. The American sovereign citizen enjoys a higher protection: she can, by her own will, expatriate. But she cannot be expatriated, even if possessing another nationality. Even if narrowly limited to the status of citizen, this “sovereignty” has since had a concrete impact on protecting the fundamental right of citizenship against any deprivation by the federal government as demonstrated in the recent cases of Dzhokhar Tsarnaev and Edward Snowden, both of whom would have likely been deprived of their American citizenship in the mid-20th century. This protection probably extends to “the privileges and immunities of citizens of the United States.” In Afroyim, Justice Black emphasized that the main consequence of the denationalization of a citizen is to “take from him the privileges of a citizen.” Narrowly defined by the 1873 Slaughter-House Cases majority opinion as “those which arise out of the nature and essential character of the national government, the provisions of its Constitution, or its laws and treaties made in pursuance thereof”—i.e. the protection of habeas corpus, not being subjected to slavery, the right to peaceably assemble and petition for redress of grievances, the right to circulate across the states within the federal territory and to have the protection of the United States government internationally—this minimalist conception turns out to be consequential in light of Afroyim. Therefore the affirmation of the sovereignty of the citizen, understood in a limited form, is perhaps the solution to the impasse Hannah Arendt highlighted: namely, the problem of the loss of all human rights encountered by those without citizenship. This could theoretically have been compensated for by the attribution of rights independently of citizenship. By emphasizing that the “loss of national rights was identical with loss of human rights, that the former inevitably entailed the latter,” Arendt implicitly admitted that one plausible solution was to protect a national from losing his or her citizenship. Arendt’s approach had not been static, but she did not much believe in international institutions or declarations at the time when she wrote The Origins of Totalitarianism. She insisted that within a world arranged around nations, nation-states remained the primary form of organization among human beings. Citizenship becomes in that context, the necessary intermediary and depository of human rights. Yet to ensure the absolute protection of citizenship, Arendt encountered a problem also raised by Michael Walzer, who points out that in order to ensure negative rights—like the right not to be murdered or enslaved—an entity must provide protection for these rights. For Walzer these entities are states. But how can protection of the citizen be guaranteed when it is the state and only the state that a citizen requires for protection? By proclaiming the sovereignty of the citizen, the Supreme Court offered an answer: instead of placing human rights outside of the state and its citizens, it inscribes human rights within the state—at its very core. The revocation or suspension of one’s citizenship is not permitted, even under exceptional circumstances. As a consequence of Afroyim, the Supreme Court added a new entity to the horizontal sovereignty already shared between states and the federal government by including the individual citizen. For those who believe in the sovereign immunity of the states, this development only adds a new level of sovereign immunity, of crossed immunities. But how to make this proclamation stable enough to resist a majoritarian action like the one Arendt had described happening at the time of the French revolution or in the United States after Chisholm? By creating a threshold difficult to trump. An important result of affirming the sovereignty of the citizen is that it makes all other individual rights guaranteed by the U.S. Constitution and courts enjoyable with continuity and reliability, without interruption or the fear of interruption. As Aleinikoff admitted, “there is some truth to Warren’s claim that one’s ability to enjoy constitutional rights in the United States is secure only if one is a citizen.” Each citizen’s possession of sovereignty for the protection of individual constitutional rights fits within a historical tradition—emphasized by Arendt—of strong belief in individual rights, thereby adding to the legitimacy of the Constitution and reciprocally reinforcing the protection of these individual rights against an attempt to reduce them. In addition, the sovereignty of the citizen is not proclaimed in opposition to the collective body of the citizens. To the contrary: “citizenship in this nation,” affirmed Black in Afroyim, “is part of a cooperative affair. Its citizenry is the country, and the country is its citizenry.”  For Black, the possibility of expelling a citizen from the citizenry would break the original social contract, an approach not far removed from that of the Roman republican model. But in inscribing the citizen—with her status absolutely protected—within a broader collective project, it reinforces her attachment to it. Each citizen’s “sovereign” enjoyment of individual rights permits a higher attachment to the nation and to We the People in times of political mobilization, in a bond of reciprocal legitimacy. Reciprocity within sovereignty was not entirely new. During a state of emergency, the sovereign’s ability to declare the exception—which, for Schmitt, could “at best be characterized as a case of extreme peril, a danger to the existence, or the like”—likely relies on a dimension of reciprocity between the sovereign power and individual citizens. One could argue that any of the individual citizens who are mobilized by the state for sacrifice can, in return, request a “sacrifice” from the state when his or her own life is at risk, such as when a person is in a dangerous situation in a foreign state, is sick, lacks either resources or legal identification documents abroad, or—as we have seen—is in need of reentry. In these circumstances it is acknowledged that the state should ensure protection of the citizen while abroad. To be sure, rescuing an individual does not require the same amount of ‘sacrifice’ as rescuing a state. But, in exchange for the sacrifice of citizens to the state and in a form of symbolic reciprocity not recognized by Schmitt, the citizen can suspend the “normal” functioning of the state and request assistance when his or her life or legal identity is at risk. Furthermore, in democratic contexts outside the specific American case, the idea of a shared sovereignty has developed in Europe among social democrats. Bobbio’s statement at least illustrates the ‘reorganization’ of the concept of sovereignty occurring in Europe at the national and international levels by reflecting different features. The process began several decades ago with a convergence between the two classical approaches toward sovereignty. First, the Schmittian seizure of power has been analyzed as keeping alive major sections of civil laws. Second, the Schmittian potential to act during exceptional times has been included within law and the Constitution so as to limit the possibility and necessity of suspending the Constitution. Third, the power to design norms has been delegated by some nation-states or partly transferred to international bodies like the European Community, the European Central Bank, the European Courts of Justice and of Human Rights, or otherwise conquered by transnational organizations like international arbitration courts. Even if this transfer or delegation has been authorized by national constitutions and even if the ultimate sovereignty still remains in these national constitutions, the manifestation of this remaining national power has been increasingly confined to the possibility of acting through exceptions such as, for example, national referenda. In that context, the increasing protection of citizens’ individual rights contributes to the reorganization of the classical model of democracy. This evolution can also be understood more anthropologically. Claude Lefort has developed the idea that democracy implies the “dissolution of the markers of certainty” represented by the King’s body, replaced instead by a permanent uncertainty at the center of the democratic power. One can argue that this certainty has been progressively transferred from the power center to its source: the citizen. I am most grateful to Bruce Ackerman, Aharon Barak, Cliff Ando, Carlo Invernizzi Accetti, Florian Grisel, Christopher Hamel, Alexandre Kedar, Jeremy Kessler, Justine Lacroix, Itamar Mann, Luke Mayville, Pasquale Pasquino, Jean-Yves Pranchère, Noah Rosenblum, Eugene Rusyn, Adam Shinar, Tristan Storme, Michel Troper, Pierre Vesperini, Rivka Weill and to the two anonymous reviewers of Humanity for very important discussions, suggestions and comments and to Idriss Fofana and Nicholas Handler, my research assistants at the Yale Law School, for their skilled and committed assistance in editing this article. Hannah Arendt, The Origins of Totalitarianism, 2nd edition, (New-York: Meridian Books, 1958), 291. Audrey Macklin, « Citizenship Revocation, the Privilege to Have Rights and the Production of the Alien », Queen’s Law Journal 40, no.1, October 2014: 1-54. Although denaturalization had similar consequences for the individual as another phenomenon called denationalization, the two are distinct: denationalization denotes a loss of citizenship, whereas, in theory, a denaturalized person has never been a citizen. See for example, Patrick Weil, The Sovereign Citizen: Denaturalization and the Origins of the American Republic (Philadelphia: University of Pennsylvania Press, 2013), 27-29. Citizenship has multiple different definitions, with three being most often identified without always corresponding. The first is legal, linking an individual to a nation-state. The second definition is political and civic. Finally there is the affective dimension: the emotional attachment to and identification with a nation state. In this article, I will deal with the legal dimension of citizenship, which is synonymous with “nationality” in international law. Therefore, I will use nationality and citizenship alternately and synonymously. Prohibition of slavery is a universal absolute right. See Aharon Barak, Proportionality, Constitutional Rights and their limitations, trans. Doron Kalir (Cambridge, UK: Cambridge University Press 2012), 29. Citizenship is only nearly absolute as it can be absent even if replaced by a proxy. On other absolute universal rights, see infra note 111. See Pham v. The Secretary of State for the Home Department, Supreme Court of the United Kingdom  UKSC 19 (Mar.25, 2015) endorsing the decision to deprive M. Pham of his U.K. citizenship because Pham’s right to Vietnamese citizenship is interpreted by the U.K. authorities as clear under Vietnamese law, even if it has been ignored by the Vietnamese government. See Perez v. Brownell, 356 U.S. 44, 62 (1958) (Warren, J., dissenting). This conviction was expressed in the internal discussion of the Court related to the case Gonzales v. Landon. See also Patrick Weil, Sovereign Citizen, 155. Schneiderman v. United States, 320 U.S. 118 (1943) and Baumgartner v. United States, 322 U.S. 665 (1944); In both cases – of a communist and a nazi- the court affirmed that the burden of proof in cases of denaturalization under section 401(j) was on the Government “by clear, convincing and unequivocal evidence.” See also Weil, Sovereign Citizen, 92-133. Gonzales v. Landon, 350 U.S. 920, 921 (1955). A citizen denationalized is in a different situation than an American woman having automatically taken the nationality of her foreign husband due to their marriage. The former has lost his American citizenship irrevocably. The latter’s marriage did not terminate the American’s citizenship; rather, it suspended it for the duration of her marriage and could be resumed at the termination of the marital relation. In the 1915 Mackenzie v. Hare decision, the Supreme Court concluded: “Her citizenship was not taken away, it was held in abeyance”. Nishikawa v. Dulles, 356 U.S. 129 (1958); Perez v. Brownell, 356 U.S. 44 (1958); Trop v. Dulles, 356 U.S. 86 (1958). Nationality Act of 1940, ch. 4, § 401(c), 54 Stat. 1137, 1169. According to section 401(g) of the Nationality Act of 1940. “The Supreme Court: The Judges or the Congress?,” Time, Apr. 14, 1958. See Bernard Schwartz, Super Chief: Earl Warren and his Supreme Court, A Judicial Biography (New-York: New-York University Press, 1983), 314. See the whole document in Weil, Sovereign Citizen, 152-154. Section 401 (j), which was added in 1944, permitted for the stripping of American citizenship from draft dodgers. Mendoza-Martinez, 372 U.S. at 167. Under section 404 of the 1940 Nationality Act, naturalized Americans who resided for two years in the country where they were born or five years in any foreign country lost their nationality. Schneider v. Rusk, 377 U.S. 163, 168 (1964). The lower court decision was therefore confirmed. See Marks v. Esperdy, 377 U.S. 214 (1964). Philip Kurland, “Supreme Court, 1963 Term,” Harvard Law Review 78 (November 1964): 170, 175. Hugo Black Papers, Box 393. The shift occurred because Justice Fortas had replaced Justice Frankfurter and voted with the majority in Afroyim and because Justice Brennan changed his view. Afroyim v. Rusk, 387 U.S.268. See Rogers v. Bellei, 401 U.S. 815 (1971). Letter of Justice Harlan to Justice Black, February 16, 1970. See Weil, Sovereign Citizen, 261, note 10. Vance v. Terrazas, 444 U.S. 252 (1980). Some uncertainty continued to exist for several years about what was meant by voluntarily relinquishing one’s citizenship. In his Perez dissent, Warren stated that if you perform an act that objectively means a change in citizenship—such as acquiring a foreign nationality—it was constitutional to be judged as having lost your citizenship. For Black, in Afroyim the threshold was higher: a person needed to knowingly give up American citizenship for it to be lost. After Afroyim, on January 23, 1969, Attorney General Clark published a statement of interpretation that left some room for the executive to consider certain acts not explicitly declared unconstitutional by the Supreme Court as an intent to abandon U. S. citizenship, such as enlisting voluntarily in the armed forces of a foreign government engaged in hostilities against the United States. Expatriation of United States Citizens, Attorney General’s Statement of Interpretation, 42 Op. A.G. 397 (1969) 34 (15) Federal Register 1079 (1969). In 1986, Congress decided that an American would lose his citizenship only “by voluntarily performing” some acts like obtaining naturalization in a foreign state upon his own application or serving in the armed forces of a foreign state engaged in hostilities against the United States “with the intention of relinquishing” his United States nationality Pub.L. 99-653, 100 Stat. 3658 (1986), amending the Immigration and Nationality Act of 1952. In 1990, however, the State Department declared that individuals will be presumed to intend to retain United States citizenship even when they are naturalized in a foreign state or accept a “non policy level employment with a foreign government.” State Department Cable to Diplomatic and Consular Post (April 1990) reproduced in Stephen H.Legomsky and Cristina M. Rodriguez, Immigration and Refugee Law and Policy (New-York: Foundation Press, 5th edition, 2009), 1367-1368. Alexander Bickel, The Morality of Consent (New-Haven: Yale University Press, 1975), 43 (quoting Justice Miller’s majority opinion in the Slaughterhouse Cases, 83 U.S. at 73). Ibid., 53. In the majority opinion in Dred Scott v. Sandford, which dealt with whether free people of African descent whose ancestors were slaves could be considered citizens, the Justices argued, “The question before us is, whether the class of persons described in the plea in abatement compose a portion of this people, and are constituent members of this sovereignty? We think they are not, and that they are not included, and were not intended to be included, under the word ‘citizens’ in the Constitution, and can therefore claim none of the rights and privileges which that instrument provides for and secures to citizens of the United States.” 60 U.S. 393, 405 (1856). Jean-Jacques Rousseau, The Social Contract, trans. Victor Gourevitch (Cambridge, UK: Cambridge University Press, 1997), 51. In 1913, Max Farrand wrote: “Second to Madison and almost on a par with him was James Wilson. In some respect he was Madison‘s intellectual superior, but in the immediate before them he was not as adaptable and not as practical.” Max Farrand, The Framing of the Constitution of the United States (New-Haven: Yale University Press, 1913), 196-198. In an important article, William Ewald has reassessed Wilson’s independent and key role in the writing of the American Constitution. William Ewald, “James Wilson and the Drafting of the Constitution,” University of Pennsylvania Journal of Constitutional Law 10 (June 2008): 901–1009. Bernard Baylin, ed., The Debate on The Constitution: Federalist and Antifederalist Speeches, Articles & Letters during the Struggle over Ratification Part One: September 1787 to February 1788 (New-York: The Library of America, 1993), 802. Peter J. Spiro, “Afroyim: Vaunting Citizenship, Presaging Transnationality,” in Immigration Stories, eds. David A Martin and Peter Schuck (New-York: Foundation Press, 2005),165. Spiro’s study highlights a paradox in Afroyim: though it bows toward citizenship, the decision to afford it absolute protection also legalized and thereby favored the development of plural citizenship. International Court of Justice, Nottebohm Case (Liechtenstein v. Guatatemala.) Apr. 6, 1955. Patrick Weil, “From Conditional to Secured and Sovereign: The New Strategic Link Between the Citizen and the Nation-State in a Globalized World,” International Journal of Constitutional Law 9, no. 3-4 (October 2011): 615-635. Trop v. Dulles, 356 U.S. 86, 93 (1958). Trop v. Dulles, 239 F.2d 527, 530 (2d. Cir., 1956) (Clark, C.J., dissenting). Comment, “The Expatriation Act of 1954,” Yale Law Journal 64, no. 8 (July 1955): 1164-1200. Ibid., 1190 note 139. In total, Arendt’s The Origins of Totalitarianism is quoted seven times in the article. Perez v. Brownell, 356 U.S 64. Afroyim v. Rusk, 387 U.S. 268. Emma Goldman, “A Woman Without A Country,” Free Vistas, reprinted in Weil, Sovereign Citizen, 187-195. See Noureddine Amara, « 1830, l’Improbable Frontière. Le Djérid à l’épreuve de la Nationalité Algérienne, » in Penser le National au Maghreb et ailleurs, eds. Fatma Ben Slimane and Hichem Abdessamad (Tunis : Arabesques, 2012), 89-105. On the right to have rights as a place in the world see Alison Kesby, The Rights to have Rights, Citizenship, Humanity and International Law (Oxford: Oxford University Press, 2012), 13-22. For Hannah Arendt there was a political dimension in her definition of the “home” which does not exist in the way that the right to reenter is today associated with nationality but which can be found in the recent United Nations commission decision Nystrom 2011. See Ryan Liss, “A Right to Belong: The Rise of Legal Protection for Sociological Membership in the Application of Article 12(4) of the ICCPR,” New York University Journal of International Law and Politics 46, no. 4 (Summer 2014): 1097-1191. Jon Newman, interview with the author, April 3, 2011. Roger K. Newman, Hugo Black: A Biography (New-York: Pantheon Books, 1994), 435-436, 471. Later Black would write a handwritten letter to Warren: In re Dissents in No 70-44. “Dear Chief I have made a number of pencil… in your two dissents… I expect to come to the office & will see you then.” Library of Congress, Box 583 Warren Papers. Nishikawa v. Dulles, 356 U.S. 138. Hugo Black, Draft of concurring opinion in Nishikawa (Mar. 3, 1958) (on file with Library of Congress, Box 333, Black Papers). U.S. Const., amend. XIV, § 1. See Paul W.Kahn, Political Theology, Four new chapters on the concept of sovereignty (New York: Columbia University Press, 2011), 102-103, (discussing the “genius” of “invention” and its belonging to a “conversation”). Michael Walzer, “Beyond Humanitarian Intervention,” in Thinking Politically, Essays in Political Theory, ed. David Miller (New-Haven: Yale University Press, 2007), 253. Isaiah Berlin, Two concepts of Liberty (Oxford: Clarendon Press, 1958), 7. Negative Liberty means “a certain minimum area of personal freedom which must on no account be violated.” Ibid., 9. Jean Combacau, “La souveraineté internationale de l’Etat dans la jurisprudence du Conseil Constitutionnel français,” in Cahiers du Conseil Constitutionnel no. 9, (February 2000) : 113-118. See Hent Kalmo & Quentin Skinner, “A concept in fragments,” in Sovereignty in Fragments: The Past, Present and Future of Contested Concept, eds. Hent Kalmo and Quentin Skinner (Cambridge, UK: Cambridge University Press, 2010), 4. Carl Schmitt, Political Theology: Four Chapters on the Concept of Sovereignty, trans. George Schwab (Chicago: University of Chicago Press 2010), 5. The genealogy of the legitimization of the sovereign power of kings and emperors in Europe is an interesting topic. It is not clear whether it flowed from God directly to kings through religious power and, only as the latest step, to “the people” or nations. Pierre Vesperini argues convincingly that during the early stage of Rome, the republican government based on the citizen’s freedom and power was so deeply legitimate that it took several generations of emperors and the work of “philosophers” invoking the king or the emperor as living law or absolute power to legitimize the sovereignty of the emperor. See Pierre Vesperini, « Comment les philosophes ont légitimé la tyrannie », in Le Tyran et sa postérité dans la Littérature Latine de l’Antiquité à la Renaissance, eds. L. Boulègue et al. (Paris : Classiques Garnier, 2013), 41. Denis Baranger, “The Apparition of Sovereignty,” in Sovereignty in Fragments, 49. Hans Kelsen, General Theory of Law and State, trans. Anders Wedberg (Cambridge, MA: Harvard University Press, 1945), 383. In her essay “On Violence,” appeared twenty years after The Origins of Totalitarianism where she analyzed the retreat from the affirmation of the sovereignty of Man at the moment of the French Revolution , Arendt noticed and regretted the retreat in America from the language of Wilson and the Supreme Court: ”the times of such clearheaded and proud separation from the traditional language and conceptual frame of the European nation-state are long past; the heritage of the American Revolution is forgotten, and the American government, for better or for worse, has entered into the heritage of Europe.” Hannah Arendt, “On Violence,” in Crises of the Republic (Fort Washington PA: Harvest Book, 1972), 108. See also Vesperini, Comment les philosophes, 33-54, arguing that the move from republic to empire in ancient Rome was also a move from the liberty and sovereignty of the citizen to that of the emperor. The idea of the negative sovereignty of the Roman citizen is illustrated by the concept of libertas, which means that the citizen is sui iuris, i.e. not a slave. He is protected by laws and the rule of law, something which changes under the empire during which time he submits to the arbitrary power of the Prince. Chisholm v. Georgia, 2 U.S. 419 (1793). Ibid. at 477. There is a philosophical tradition associating the sovereignty of the individual with that of the state. Richard Tuck mentions how “Grotius has made the claim that an individual in nature (that is, before than transferring any right to a civil society) was morally identical to a state, and that there were no powers possessed by a state which an individual could not possess in nature.” Richard Tuck, The Rights of War and Peace: Political Thought and the International Order from Grotius to Kant (Oxford: Oxford University Press, 1999), 89. Kurt T. Lash, “Leaving the Chisholm Trail: The Eleventh Amendment and the Background Principle of Strict Construction,” William & Mary Law Review 50, no. 5 (2009), 1646 (quoting Dunlap’s Am. Daily Advertiser Phila, (Feb.18, 1783) at 3). At that time, there was often no single opinion representing the Court; instead, each justice would deliver his opinion separately. Ewald, James Wilson and the Drafting, 947. Chisholm, 2 U.S. at 455. Chisholm was decided on February 18, 1793. The Eleventh Amendment was proposed by Congress on March 4, 1794. Ratification was completed in February 1795. See Phil Lerner & Philip Kurland, The Founders of the Constitution, vol. 5 (Chicago: university of Chicago press, 1987), 407. On the context in which the issue of state immunity had already been raised in Massachusetts and other states of the young Union, see Lash, James Wilson and the Drafting. See Akhil Amar, America’s Constitution? A biography (New-York: Random House, 2005), 334. Hans v. Louisiana, 134 U.S. 1, 12-13 (1890) (quoting Federalist No. 81). Seminole Tribe of Florida v. Florida, 517 U.S. 44, 64 (1996). Alden v. Maine, 527 U.S. 706, 713 (1999). “The comments made upon the decision in Chisholm v. Georgia do not meet my approval. They are not necessary to the determination of the present case. Besides, I am of opinion that the decision in that case was based upon a sound interpretation of the constitution as that instrument then was.” Hans, 134 U.S. at 21. See Randy E. Barnett, “The People or the State? Chisholm v. Georgia and Popular Sovereignty,” Virginia Law Review 93, no. 7 (November 2007): 1729-1758, at 1742. “However inspiring he may find the opinions of Jay and Wilson, Americans of the Founding era emphatically disagreed. It took them only one year to mobilize in Congress and the states to enact the Eleventh Amendment which repudiated Chisholm and propelled the Constitution in a different direction. There are only two other times in American history when a Supreme Court judgment has been self-consciously repudiated by formal amendment: the Fourteenth rejected Dred Scott; the Sixteenth, the Income Tax Cases.” Bruce Ackerman, “De-Schooling Constitutional Law,” Yale Law Journal 123, no. 8 (June 2014): 3104-3144. Afroyim v. Rusk, 387 U.S. 253, 259 (1967) (quoting 31 Annals of Cong. 1050-51 (1818) (statement of Rep. Lowndes)). See Seyla Benhabib, “International Law and Human Plurality in the Shadow of Totalitarianism: Hannah Arendt and Raphael Lemkin”, in Hannah Arendt and the Law, eds. Marco Goldoni and Christopher McCorkindale (Oxford and Portland, NY: Hart, 2012). See Kesby, The Rights to have Rights, 5. See Heather K. Gerken and Ari Holtzblatt, “The Political Safeguards of Horizontal Federalism”, Michigan Law Review 113, no. 1 (2014): 57-120. On the concept of crossed immunities in a federation see Olivier Beaud, Théorie de la Fédération (Paris: P.U.F., 2007), 185. Implicitly it forces the state to be what Olivier Beaud calls the guarantor (“le garant”) of this right. Olivier Beaud, “Comment réinterroger l’Etat à partir des notions de citoyen et de citoyenneté ?”, in Formes et Doctrines de l’Etat, eds. Pierre Bonin, Pierre Brunet and Soazick Kerneis (Paris : Dalloz, 2015). If, seventeen years after a federal court adjudged him entitled to be a citizen, that judgment can be nullified and he can be stripped of this most precious right, by nothing more than reexamination upon the merits of the very facts the judgment established, no naturalized person’s citizenship is or can be secure. No citizen with such a threat hanging over his head could be free. . . . His best course would be silence or hypocrisy. This is not citizenship. Nor is it adjudication. Robert C. Post, Constitutional Domains, Democracy, Community Management (Cambridge, MA: Harvard University Press, 1995), 373. Robert Post also notes that “if public discourse is kept free for the autonomous participation of individual citizens, and if government decision-making is subordinated to the public opinion produced by public discourse, there is the possibility that citizens will come to identify with the state as representative of their own collective self-determination.” Ibid., 7. Afroyim v. Rusk, 387 U.S. 253, 267 (1967). Recall the manner in which Justice Warren, in point 5 of his handwritten notes, jointly mentions the concept of compact federalism and the sovereignty of the individual in order to express that “citizenship is the basic and inalienable right of the individual,” linking the sovereignty of the citizen to an original compact. Cliff Ando quotes Cicero saying in Pro Caecina 99-100 : « Exsilium enim non supplicium est, sed perfugium portusque supplici. Nam quia volunt poenam aliquam subterfugere aut calamitatem, eo solum vertunt, hoc est sedem ac locum mutant. Itaque nulla in lege nostra reperietur, <ut> apud ceteras civitates, maleficium ullum exsilio esse multatum » which he translates as: “Exile is not a punishment, but an escape or outlet from punishment. For those who want to escape some punishment or disaster ‘turn over the soil,’ that is, they change their seat and home. In no law of ours is it found, as it is in other communities, that any misdeed is punished with exile.” Ando explains this by the fact that a tight link existed between the citizen and the political community. The term civitas meant the legal status of each citizen, the whole body of the society (civis:civitas:civitas:populus), as though the political community was achieved or fulfilled within each citizen. Cliff Ando, “Making Romans: Citizens, Subjects and Subjectivity in Republican Empire,” in Imperial Cosmopolitanisms: Global Identities and Imperial Cultures in Ancient Eurasia, eds. Myles Lavan, Richard Payne and John Weisweiler (Oxford: Oxford University Press, Forthcoming). See Post, Constitutional Domains, 7. See Bruce Ackerman, We the People, vol. 1 (Cambridge, MA: Harvard University Press, 1991), 266-294. Kahn, Four new chapters, 31. See, e.g., Slaughter-House Cases, 83 U.S. 36, 79 (1872). Jean Jaurès, « La Question décisive”, August 23, 1892, in Jaurès, L’intégrale des articles publiés dans la Dépêche du Midi, ed. Rémy Pech (Toulouse: Editions Privat, 2009), 238-239. See Noberto Bobbio, Teoria Generale Della Politica (Torino: Einaudi, 1999), 331-33. As the sovereign suspends the law for the purpose of the safety of the city, many laws which do not have to deal with the safety of the nation state are not suspended such as family or property laws Michel Troper, “L’état d’exception n’a rien d’exceptionnel”, in Spyros Théodorou ed., L’exception, 170. This was also the case during the French Terror. Questions occasionally arise today about the extent to which the constitution adopted on June 24th, 1793 and suspended by decree on October 10th 1793, actually went into effect, and about the way to interpret its article 3, which conferred citizenship automatically after one year of residence. Contemporary courts had no hesitation: the 1793 constitution had gone into effect, only the sections pertaining to politics and government were suspended; the courts of Lyon, Colmar, Orléans, Douai, and Aix deemed that people who met the prescribed conditions had acquired French citizenship. See Patrick Weil, How to Be French. A Nationality in the Making since 1789, trans. Catherine Porter (Durham N.C: Duke University Press, 2008), chapter 1. See the 2008 reform of article 16 of the French Fifth Republic Constitution: the possibility of acting during a time of emergency without going through the Parliament has been limited. See Bruce Ackerman, Before the Next Attack: Preserving Civil Liberties in an Age of Terrorism, (New-Haven: Yale University Press, 2007). See Michel Troper, “The Survival of Sovereignty”, in Sovereignty in Fragments, 148-150. See Leca, “L’exception en politique,” 92-93. This has been the case when the French and the Dutch peoples rejected the project of the European constitution, and has been the frame of the German Supreme Court decision on the Maastricht Treaty. The right attributed to individuals to sue their own state in front of international courts—like the European Court of Human Rights—permits these Courts to exercise a sovereignty which trumps national legislations in the way Paul Kahn describes the United States Supreme Court having done, though not in the name of a sovereign people but, rather, in the name of individual rights. See Kahn, Four new chapters, 85-86. Claude Lefort, Democracy and Political Theory, trans. David Macey (Cambridge, UK: Polity Press, 1988), 19. Lefort, ibid., 224-26 (“Power belongs to no one; those who exercise power do not possess it; . . . they do not, indeed, embody it; . . . the exercise of power requires a periodic and repeated contest; . . . the authority of those vested with power is created and re-created as a result of the manifestation of the will of the people”).